On June 30, 1825, German-Australian physician, geographer, and botanist Baron Sir Ferdinand Jacob Heinrich von Mueller was born. Von Mueller migrated to Australia in 1848 for health reasons, and there became the country’s greatest 19th-century scientist as a great botanical collector and writer. His contributions covered a wide field of sciences such as geography, pharmacy, horticulture, agriculture, forestry, paleontology, and zoology. His activity as a botanist is shown by hundreds of Australian plant names which are followed by ‘F. Muell‘. 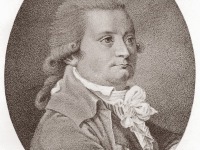 Mueller was born at Rostock, in the Grand Duchy of Mecklenburg-Schwerin, as the only surviving son to Frederick Mueller, commissioner of customs, and his wife Louisa. 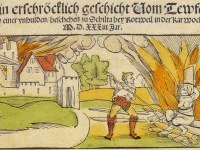 After the death of his parents, Mueller was educated by his grandparents in Schleswig, who apprenticed him to a chemist and pharmacist in Husum. At the age of 15, he passed his pharmaceutical examinations and studied botany at Kiel University. In 1847, he received his degree of Doctor of Philosophy from Kiel for a thesis on the plants of the southern regions of Schleswig. 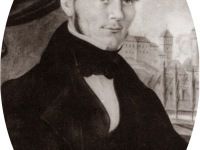 Mueller’s sister Bertha had been advised to seek a warmer climate for her health, and the great botanist Ludwig Preiss, who had recently returned from Perth, recommended Australia, so in 1847, Mueller and his two surviving sisters sailed from Bremen with the Hermann von Beckerath, arriving in Adelaide on 15 December 1847. While still on the ship, he reportedly fished his first plants out of the water to analyse them. Working occasionally as a pharmacist, he devoted most of his time to investigating the South Australian flora from Mount Gambier to the Flinders Ranges and Lake Torrens. Shortly afterwards, he obtained 20 acres (81,000 m2) of land not far from Adelaide in the Bugle Ranges, and had a cottage built there. Mueller thought to open a chemist’s shop in the gold diggings, so in 1851, he moved to Melbourne, capital of the new colony of Victoria. He had contributed a few papers on botanical subjects to German periodicals, and in 1852, sent a paper to the Linnean Society of London on “The Flora of South Australia“, thus beginning to be well known in botanical circles. In 1852 Mueller went to Melbourne where Lieutenant-Governor Charles La Trobe appointed him government botanist in 1853, a post that was newly created for him and which he should hold for 43 years until his death. With J. Dallachy he visited Mount Buffalo and the Ovens River where he reported indications of gold. Alone he went to Mount Buller to observe the alpine vegetation and spent several weeks around Port Albert and Wilson’s Promontory before returning to Melbourne. He estimated that he had collected specimens of over half the indigenous vegetation of Victoria. He discovered species earlier claimed to be found only in Tasmania and added new genera to the flora of Australia. He reported on the possible medicinal value of some plants in the treatment of consumption, rheumatism and scurvy, and emphasized the commercial value of the acacia for its wood, tannin and gum, and the Australian manna for its saccharine content. Also in 1853, e established the National Herbarium of Victoria, which can still be visited today. It has many plants from Australia and abroad, many of which were collected by Mueller. In 1854 Mueller was appointed a commissioner for the Melbourne Exhibition and spent much time organizing an exposition. In 1857 Mueller was appointed director of the botanical gardens at Melbourne, where he had built what is now the national herbarium. He continued to make numerous explorative trips throughout Australia. Then, as a phytographic naturalist, he joined the expedition sent out under Augustus Gregory by the Duke of Newcastle, Secretary of State for the colonies. He explored the Victoria River and other portions of North Australia, was one of the four who reached Termination Lake in 1856, and accompanied Gregory’s expedition overland to Moreton Bay. Mueller, for his part, found nearly 800 species in Australia new to science. He sent huge amounts of plants and seeds to grateful public gardens, herbaria, institutes and individuals throughout the Australian colonies and overseas. Mueller published in this year his Definitions of Rare or Hitherto Undescribed Australian Plants. From 1854 to 1872, Mueller was a member of the Victorian Institute for the Advancement of Science, which later became the Philosophical Institute of Victoria. He was president of the Philosophical Institute in 1859 when it received a royal charter and became the Royal Society of Victoria. He was an active member of the society’s “Exploration Committee” which established the Burke and Wills expedition of 1860. 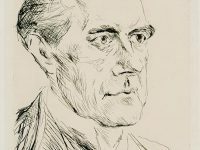 An indefatigable worker, Mueller’s correspondence regularly reached 3000 letters a year; he published over 800 papers and major works on Australian botany and lectured on subjects ranging from rust in cereals and the culture of tea in Victoria to an historical treatise On the Advancement of the Natural Sciences Trough Ministers of the Christian Church. He published 11 volumes of Fragmenta phytographica Australiae (1862–1881), two volumes of the Plants of Victoria (1860–1865), and other books on the Eucalyptus, Myoporaceae, Acacia, and Salsolaceae, all profusely illustrated. Mueller’s widespread interests included the exploration of New Guinea and Antarctica. He argued that Australia should colonise these land masses and served on the first Australian Antarctic Exploration Committee and devoted much time to it in his last years. In 1871 he was appointed a hereditary baron by the King of Württemberg, having been granted his `von’ in 1867, and knighted by Queen Victoria. Ferdinand von Mueller died on 10 October 1896 in South Yarra, Melbourne. At yovisto academic video search, you may join Shane Carmody, Director, Collections and Access, State Library of Victoria, in conversation with leading historians and researchers Professor Geoffrey Blainey, Robyn Annear and David Phoenix to find out what the rich collection of records and artefacts tells us about the Victorian Exploring Expedition. Courage and Folly – The Burke and Wills Expedition Crossing Australia, SciHi blog, August 20, 2013.